River rocks are extremely flexible to work with when designing an outdoor space. Their neutral colors harmonize with virtually any type of vegetation and their small size allows them to fill most paths. 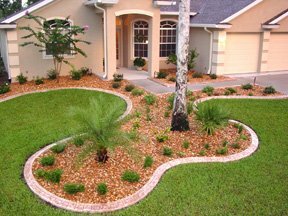 In this outdoor design, river rocks are used to fill a curvaceous garden area that wraps around the home, leading to a small peninsula holding a variety of garden plants.